This card is a perfect match for an avid networker or peripheral-sharer, or anyone who needs a few more connection options. 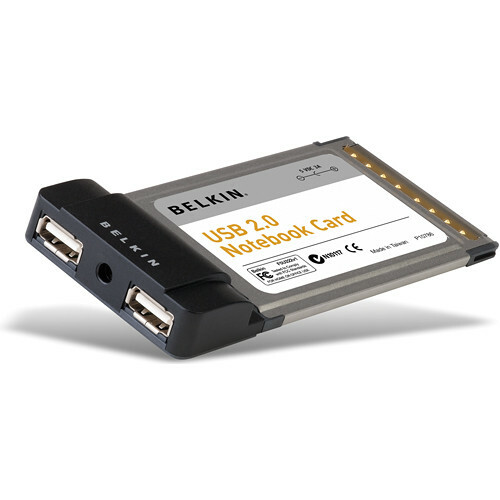 Belkin's USB 2.0 CardBus Card adds two USB 2.0 ports to your Laptop with a 480 Mbps bandwidth. Simply plug this card into a 32-bit Type II CardBus Slot on your laptop for extra USB options. You can also connect a Belkin USB 2.0 hub into one of the USB ports to connect up to 127 additional devices (although you'll likely need more RAM). In any situation, Belkin makes attaching peripherals easy. It works with a notebook running Windows 98 SE or higher and with a Power Mac computer running OS 10.2.7 or higher. Plug this card into a Type II CardBus slot on your laptop for extra USB options. Connect a Belkin USB 2.0 hub into one of the ports to be able to connect up to 127 additional devices. Bringing you the best in USB technology, this USB 2.0 DockStation transfers at speeds of up to 480 Mbps per port/device in high-speed mode. Connecting can be done anywhere at any time. Just plug into 32-bit Type II CardBus slot then attach USB devices. The USB 2.0 hub is backward compatible with USB 1.1 computers and devices. Power Mac computer running OS 10.2.7 or above. Box Dimensions (LxWxH) 5.1 x 3.8 x 9.7"
Hi-Speed USB 2.0 (480Mbps) Notebook Card is rated 5.0 out of 5 by 1. Rated 5 out of 5 by let's call him Steve from Great remedy for Toshiba with bad USBs For all those Toshiba Satellite laptop owners that experienced the blown USB ports this is a great simple remedy. I can't comment on durability yet as I just got it, but it works just fine.